Ladies and djentlemen, Finland is back at it again cranking out those dank new metal bands. They are the land of metal, and they keep proving it. 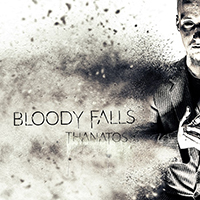 Newcomers out of Valkeakoski BLOODY FALLS are here with their debut full length effort “Thanatos”. It is contemporary metal to the core. Incorporating all the best elements of metalcore, death metal, djent, it truly slams. Capped off with powerful and FANTASTICALLY delivered harsh vocals from Tanawat Thongprem, it’s quite a statement for a debut effort. Just about my only criticism could be the production value, which is a little rough. But, I can get over that seeing they are a young band, and to their credit they do keep the mix tight and it sounds great. All parts are crisply heard and blend together beautifully into a decidedly bassy/djent type sound with an emphasis on breakdowns and staccato rhythms. But, it’s not without its fair share of melody either. Lots of intricate guitar work interlace melodies through the music, and we even get synth ove rtop some parts, track 4 “Nocturnal” is a notable example. The choruses, while still driven by exclusively harsh vocals from Thongprem, blend together with the melodies at hand in a way that does not sound like ARCHITECTS but is certainly reminiscent to their approach, and it works very well. It sounds very fresh and modern, and the choruses have a relateable angst and edge. From top to bottom, “Thanatos” is the same blend of metalcore/djent with aggressive guitar and staccato rhythms. There aren’t any songs that really break away from this, all 10 tracks follow generally the same formula, making it a bit difficult to choose standouts. Normally this would be a point of critique for me, but the sound BLOODY FALLS is delivering is so good I’m okay with it. Within the confines of the formula they’ve established, they explore tons of different melodies and rhythms, we get a fair share of beautifully delivered solos, and it doesn’t much break away from what it wants to be. If you’re vibing with the djent, you’ll like it. Choice songs for me would have to be lead single “My Halo Of Flame”, “Amongst The Living Dead”, “New Empty”, and “Cry For Freedom”, which straight up sounds like PERIPHERY at times. Closer “Virtual Reality” also deserves a mention. It’s one of the most complete tracks on the album: chugging djent riffs, crisp solos, more PERIPHERY vibes in the melody, and an overall chunky and groovy but melodic feel. It’s a very strong way to end the album. Overall, this is a rock solid piece of contemporary metal from BLOODY FALLS, and an exciting debut. If you’re into metalcore/djent/death metal (a little), give it a listen. You will almost certainly love what you’re hearing.